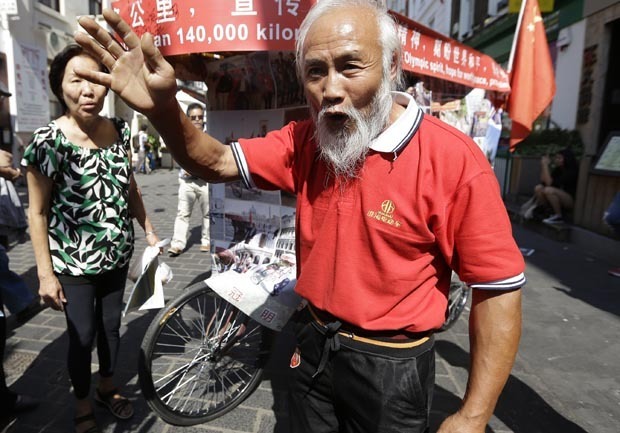 (AP) LONDON - It's a tale of Olympian proportions: A man, a rickshaw, and a slow journey from a Chinese village to London through 16 countries. Chinese farmer Chen Guanming claimed Thursday that his two-year odyssey to the London games took him from Thailand's floods to Tibet to snowed-in Turkey to Britain since he started in 2010. The 57-year-old, who said he had never traveled outside China before this trip, said he wanted to support the athletes and "spread the Olympic spirit." He's also seeking a last-minute ticket to attend Friday's opening ceremony. "I came to support and cheer all the people from all over the world who are participating in the sports," said Chen, who sports a silvery white beard and a small ponytail. "I'm volunteering, I'm not looking for a reward." His three-wheeled rickshaw, loaded with his possessions, is plastered with pictures of him posing in front of international landmarks such as the Eiffel Tower in Paris and the Petronas Twin Towers in Kuala Lumpur, Malaysia. Chen said he became inspired to come to London at the end of the Beijing Olympics in 2008, when British media invited him to the next games. He didn't have a ticket, but he promised them he would get there. According to Chen, his journey began in April 2010 in his village in eastern China's Jiangsu province, where he farms rice and other crops. Over the next two years, he said he covered 16 countries including Vietnam, Thailand, Pakistan, Turkey and Italy. His worst experiences, he said, were travelling during Thailand's floods and being trapped in freezing temperatures in the snow in Turkey. He arrived in Britain by ferry from France on July 6, he said. Chen said he started arranging his visas beginning in 2009 and was helped financially by friends and kind people  especially Chinese communities  wherever he went. His account cannot be independently verified and it is not clear how he managed to traverse so many countries' borders. A BBC interview with him, however, showed tourist visa stamps in his passport from countries including Pakistan, Thailand and Iran. A YouTube video posted in May shows him in Rome, surrounded by curious passersby. John Beeston, a British insurance broker who spoke some Mandarin, said he found Chen looking lost on London's bustling streets on July 9. "We are trying desperately to get him into the opening ceremony because his story has to go around the world," he said. But Chen is proud of his epic journey even if he does not get into Olympic Stadium. "I came. I did it. I'm very happy to have come to beautiful London," he said. His journey doesn't end with the British capital. In a month or two, he said he plans to take a ship to the U.S. and Canada, and he also wants to go to Brazil. "I want to go to the Rio Games too," he said.